Rent your own masterpiece with this self catering apartment in Tuscany, featuring museum-like frescoed ceilings and walls. Spacious and beautifully furnished, this Tuscany vacation rental in Florence faces an inner courtyard and will provide you with a quiet retreat in the midst of a busy city. See the sites, explore the country, and then return home to this Tuscany apartment. This lovely, completely restored apartment is situated on the first floor (the main floor or “piano nobile”) of a 16th century palazzo. The architecture of the surrounding buildings, the quiet terrace, and the private courtyards provide ample sunlight and an atmosphere of seclusion. Although there is no private parking available in the building, there are garages in Piazza Santa Croce, as well as on via Fiesolana. This charming, relaxing apartment is decorated with both modern elements and historic elements that are typical of the neighborhood. The owner, a famous photographer and writer, has chosen elegant furnishings and touches of “high tech” design. The apartment entrance is decorated with 18th century wall/ceiling frescoes. Through an archway, there is a modern living room, which has comfortable couches, a decorative marble fireplace, and a dining area with a table for four. In the bedroom, the queen-size bed (160 cm) is a unique cross between a traditional wooden-framed bed and a modern futon. This bedroom also has an en suite bathroom (with sink, tub) behind a glass wall; a half-bathroom (with WC, bidet) is separate from the bedroom. 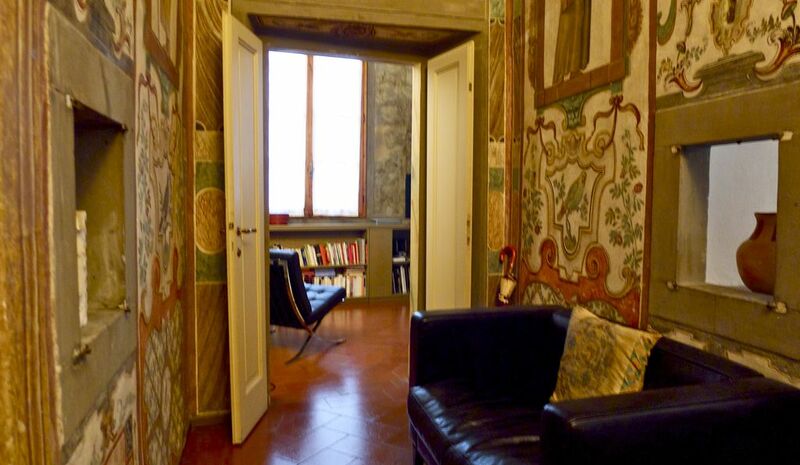 The apartment also has a studio, decorated with frescoes, which can also be used as a guest bedroom. It has a single sofa bed (available for 150 euros per week), and there is an adjacent bathroom (with shower). The studio is connected to a bright kitchen; the kitchen has access to a lovely terrace overlooking a large courtyard (no city view). The terrace has a table and chairs, making it a perfect place for al fresco dining. Air Conditioning is in the kitchen and the living room. A beautiful apartment with everything we needed to comfortably live like locals. The platform bed worked well for the person sleeping on the right side, but was difficult for the left hand person where the mattress is essentially on the floor. Us older folks have issues getting up from the floor! The Santa Croce piazza and church bells. I love the sound of those bells. The proximity to stores, restaurants and walking distance to just about everything. The restaurant Bocadama in Piazza Santa Croce is very close and accommodating. That was the only restaurant we repeated. We mostly enjoyed searching out and dining at different local mom and pop restaurants. Our taxi from the train station knew exactly where to go. No GPS required. The greeting was warm and friendly. We were treated to a lovely fresh fruit basket and bottle of wine. Both were much appreciated. Ms Vallenti was very generous with helpful information about places and activities in the area. Check out was quick and easy. Florentine experience. If you appreciate history and architecture, not just seeing it in a museum, this is the place for you. Elegance all the way. The interior design and the artwork. A bit of old and new. I prefer a softer mattress. We provisioned from the local market for some meals. The food was amazing. Convenient to all the sights, yet quiet. The other side of the river was perfect for sights and greenery and great views; we could walk everywhere. This property has all the comforts of home and then some. Everything went smoothly in that regard and we felt our host was helpful and welcoming. Spacious, elegant, and full of character, Chiara provided a delightful home with both excellent indoor living spaces and terrace for eating which overlooked numerous gardens. Location was pleasantly off the main tourist route. Close to superb food market, Sant'Ambrogio, the Santa Croce church and museum, and the Arno. The grandeur, historical character, decor, art and outdoor space for meals and drinks. Fifteen foot ceilings, frescoes, lovely soaps at every sink. Well equipped kitchen, large refrigerator. The coffee mugs and no access to CNN in English on the TV. Proximity to the Arno, Piazza Santa Croce, flea market and food market at Sant'Ambrogio. Also, it felt like a real neighborhood. Bring a small flashlight. Early during your visit take a cooking class from Marchella at Giglio Cooking School, on Via del Ghirlandaio 6b just a bit east of the apartment. Then shop at Sant'Ambrogio and create delicious treats at the apartment. Ask her to teach you Risotto with Taleggio and Pear! For dinner out, make a reservation at Trattoria Sostanza Il Troia. Via Porcellana, 25r. Honest and delicious. Gelateria della Passera is superb also. Although we were late arriving and taxi driver initially took us to the incorrect street, the property manager was waiting patiently. The frescoes and creative interior design, the balcony. We did a lot of cooking and there were ants in the kitchen that seemed to come from the adjacent plant-filled balcony. Food had to be kept in the fridge. I cannot say how much renting the apartment added to my glorious trip to Florence! I loved the property. The apartment is decorated beautifully. It is a calm, peaceful environment that really helps transport you to another world. I loved the bedroom set-up, but I spent most of my time out on the terrace reading, drinking a glass of wine and listening to the birds. Just awesome. It could be a bit loud to someone not used to living in an apartment building. On Friday and Saturday nights you could hear the goings-on of the neighbors and people in the street. No big deal for me, but I could see how a light sleeper might be disturbed. Editor's Notes: All of the windows face a courtyard. Loved it!!! Florence is a great walking city and Santa Croce is literally steps from everything! I would walk to the river and watch the incredible sunsets and then back to the apartment each night. Nicely off the tourist path, you felt like a local walking down the small street towards the building! I stayed exclusively in Florence. A wise decision, I think. Elisabeth provided everything I needed. I wanted for nothing while I was there. I am sure that some will mind having a small, non-satellite TV, but it was fine with me. There are many great restaurants within waking distance- Boccadama and Osteria de Benci were my two favorites near the apartment! Elisabeth was pleasure to deal with. Location. Beautiful furnishings. And the owner was gracious and lovely. The smell of cigarette smoke. As an ex-smoker, I was able to tolerate it, but I know many who wouldn't. Editor's Note: Smoking is only allowed on the balcony. Lots of good restaurants of the non-touristy sort provided you were willing to hunt them down. Well away from the tourists. Security Deposit: Upon arrival at the property you are required to pay to the property representative a security deposit payable in cash. The security deposit will be returned to you prior to your departure minus any extra charges or accidental damages to the property. The listed security deposit is: 400 EUR.